Sunseed in South Street, Wellington was the vision of Tony Bourne well over 30 years ago. After many successful years trading, Tony has now retired and we are delighted to be the new owners of such a well supported business in the heart of the community. 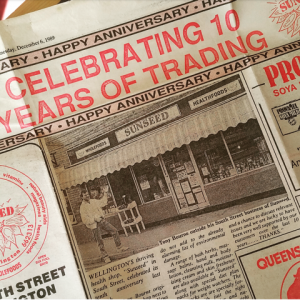 In 1989 Sunseed celebrated its 10th anniversary and was featured in the Gazette where Tony thanked all his loyal customers and 30 years on we would like to do the same! We will keep doing what has been done best for the last 30 years; selling the very best range of health products with a great team in-store to advise wherever needed. A new chapter begins ….